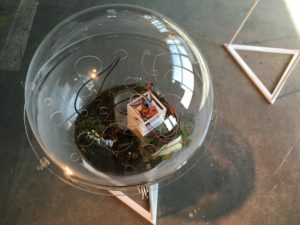 This year’s edition of Ars Electronica, the annual European gathering for art, technology, and society in Linz (Austria), focused on how the call for social intelligence is now being juxtaposed to our enthusiasm for the digital world and IA, in order to rethink our ambivalent relationship towards technology. 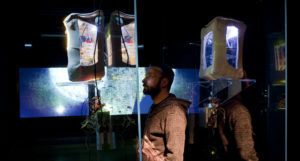 Strong expectations on the fact that artistic participation can provide an advanced strategy for enhancing and strengthening ethical conscience and responsible innovation in the European path towards AI. This project created by François-Joseph Lapointe & Marianne Cloutier is an installation and a performance which symbolically explores the idea of repairing the microbiome as a way to erase the traumatic experience of Caesarean birth. 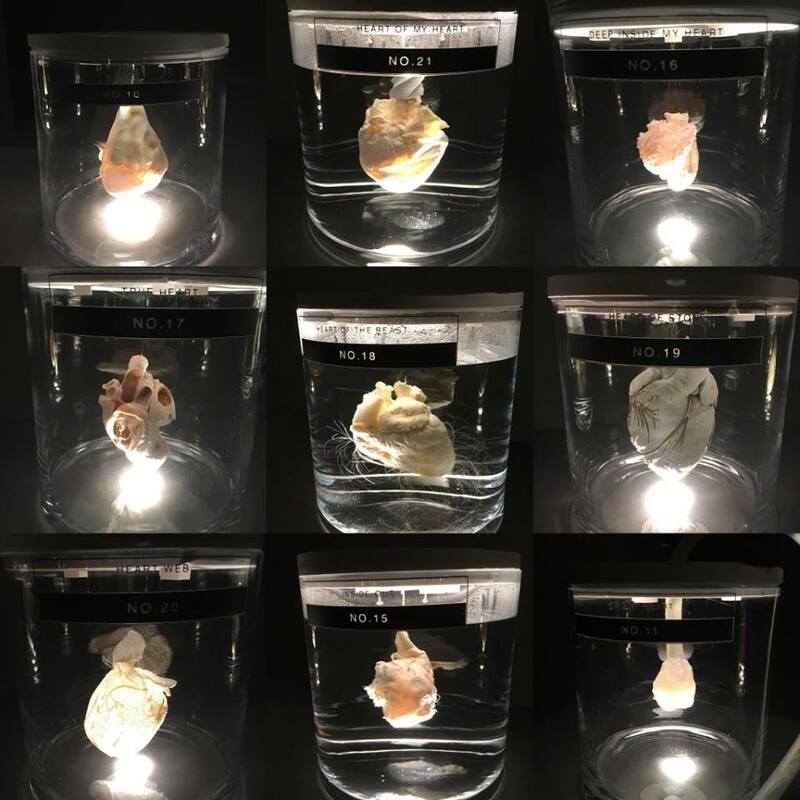 Through this work the artist opens a new space for dialogue and awareness about how mothers and child are treated in the medical environment. * Research field that states that measurement & observation does something to the object being evaluated. 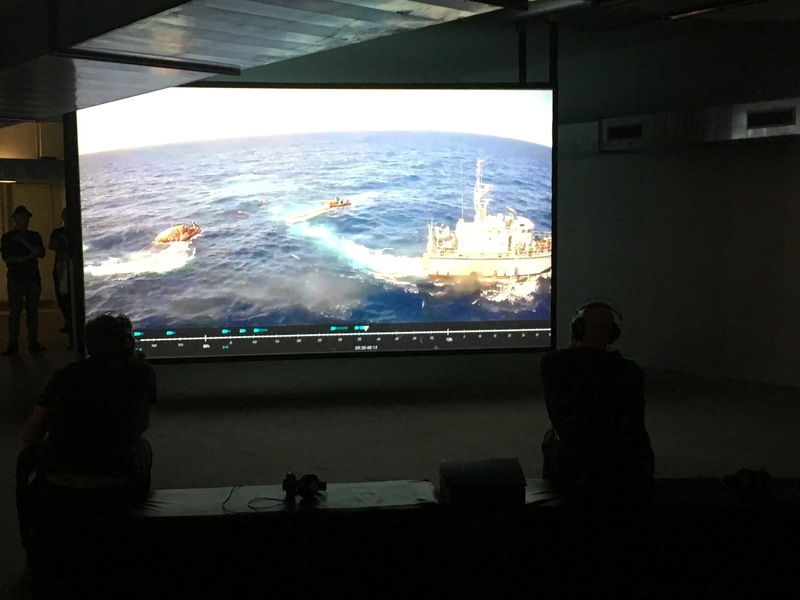 This project made by Forensic Oceanography & Forensic Architecture consists of two investigated cases : the “Luventa” case and the “Sea watch vs. Libyan Coast guard” case. Each concerning one of the dimensions of this policy which entails migrants being brought back to a country where their lives are endangered, and their human rights systematically violated. Thanks to the exponential increase of video documentation made by the different actors involved, a unique form 3-D modelling of incidents was developed together with Forensic Architecture. This new form of media integrates different observers into the tracking and creation of an information in order to make us experiment it as a multilayered reality. 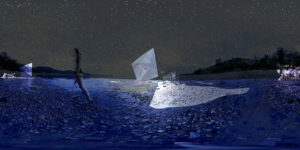 This video work from Agustina Isidori was part of the Hexagram* Campus “Taking Care” exhibition. These two experimental videos take us on a reflection about naturalization of gender-based violence. 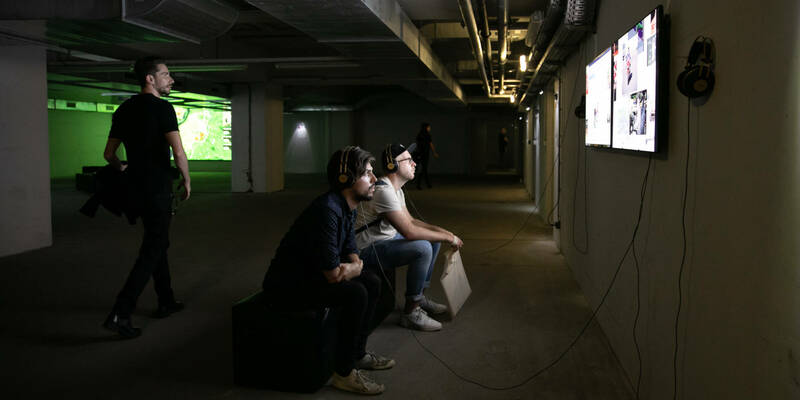 In one of the video, video gaming is explored as an instrument for conceptual thinking and a tool to work through social issues. The work of Agustina takes us on a journey into deep cultural and social issues. 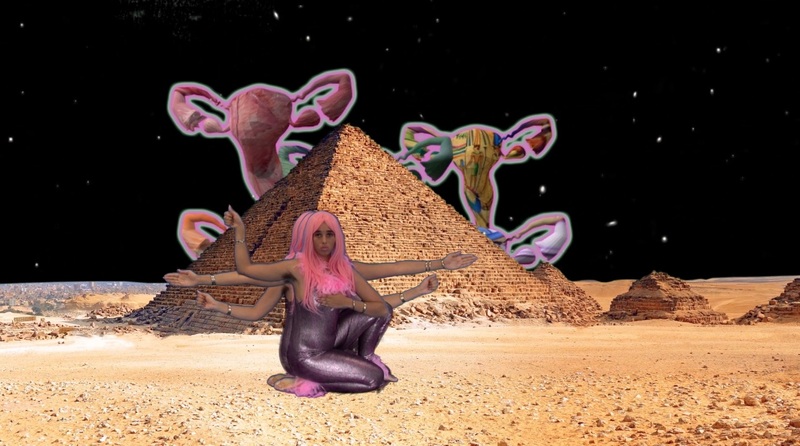 She uses a reconstruction of reality through different mass media, real material and artistic footage, creating a multilayered experience of the subject she wants us to reflect on. *An interdisciplinary research network for media arts, design, technology and digital culture based in Montreal Quebec. 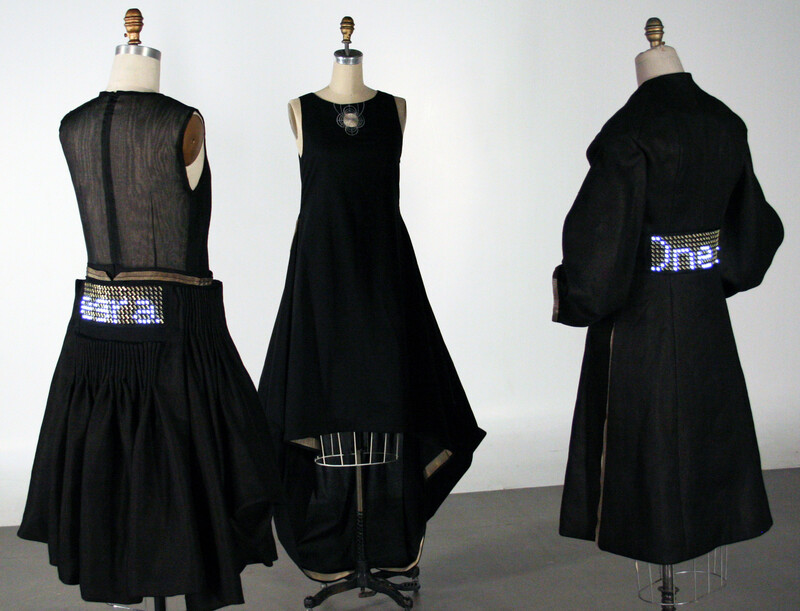 The design of these suits created by Barbara Layne & Lauren Osmond draw inspiration from the 19th century fashion and from James Maxwell’s pioneering theories of electromagnetic fields. When the dresses are physically aligned, the strength of the connection created will change texts through the LED panels giving a spatial presence to the garments. 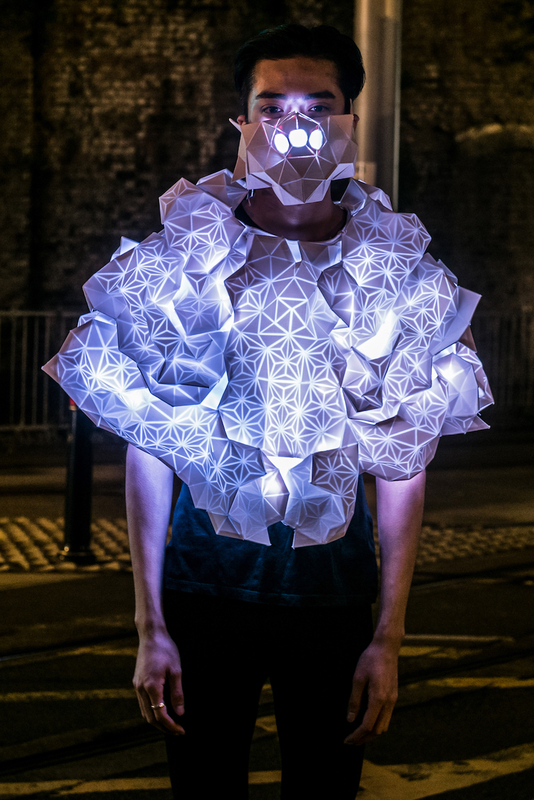 This work makes us experiment fashion as a spatial interaction tool and a collective object who can share information with other objects. Visual representation of our own impact on one another and the new connections that our movement in space generate. A large-scale digital and performative artwork by Kasia Molga that explores London’s inhabitants daily exposure to air pollution through a combination of wearable technology and immersive theater. The idea is to reveal the changes of black carbon particulates in the air. The performance is directed with an air pollution scientist Professor Frank Kelly, the project was commissioned by Invisible Dust and Euston Town BID (Business Improvement District). Rasa Smite, Raitis Smits, RIXC & MIT ACT gave a voice (by using LoRa radio technology) to the swamps, these vast wetlands with their ancient ecosystems who are like time capsules to us. They contain dormant resources and myriad of unknown species. They showed the data informations in the gallery space in real-time by installing microbial fuel cells, environmental monitoring sensors and data transmission networks to explore the sonic environment of these ecosystems. 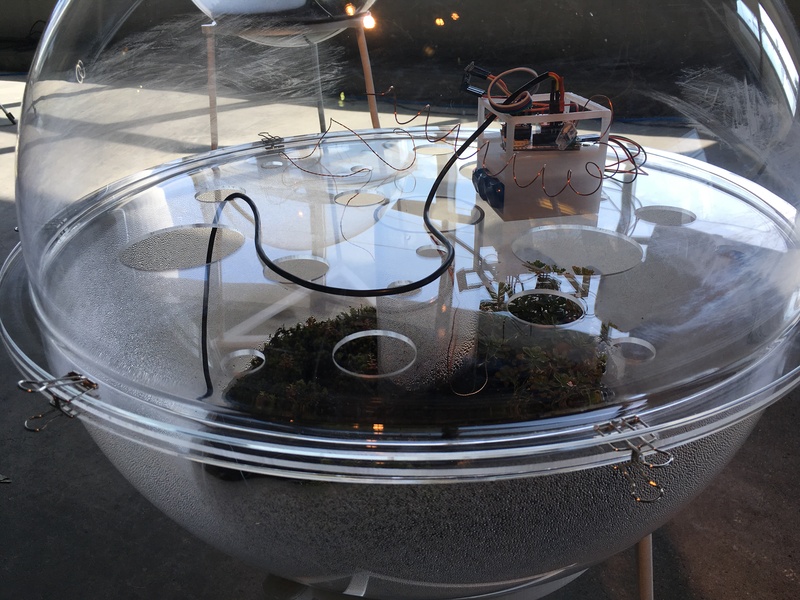 The aim of the project created by Robertina Sebjanic & Gjino Sutic is to illuminate the invisible anthropogenic pollutants in water habitats. 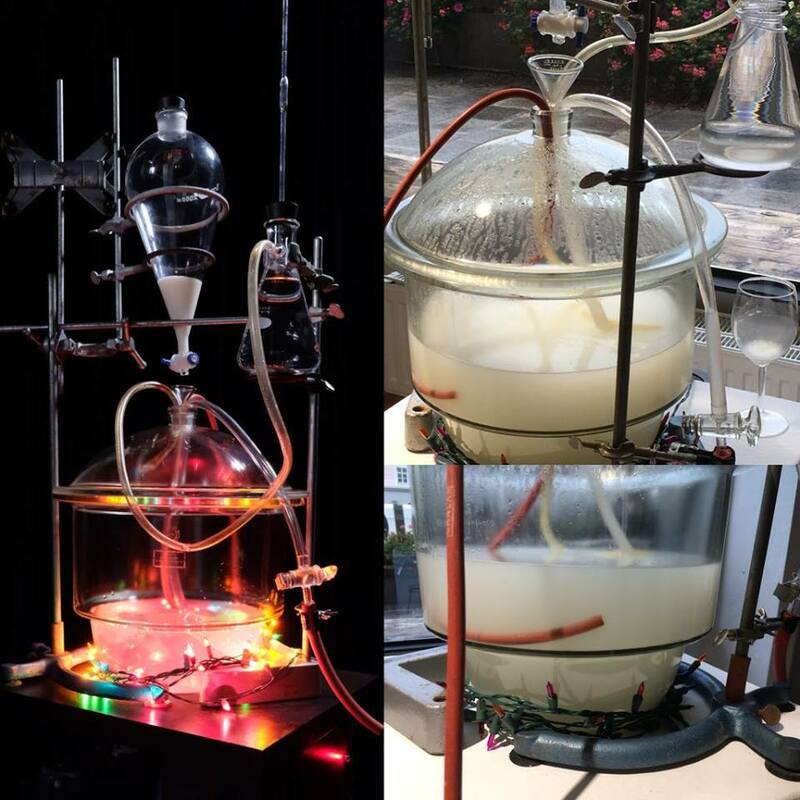 It combines art, science and citizen-science approach to collect and process information on pollutants. *Biotweaking : acts or (art) of improving biological organisms on any level, by available means..” concept by Gjino Sutic to fully define his work. 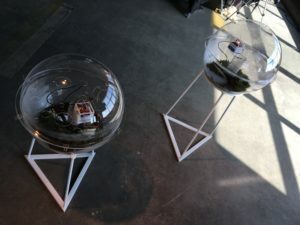 *Aquatocene : is a series of research-based artworks initiated by Robertina Sebjanic that deals with cultural, (bio)political and ecological realities of aquatic environments and their consequences / challenges. O.S.T.R.I.C.H. (Outer Space, terrestrially Resonated in cloaked haptic-experiences) is capsule collection of wearable earth suits created by Dawn Faelnar that bring the experiences of different celestial phenomena recorded during official spatial missions down to earth. 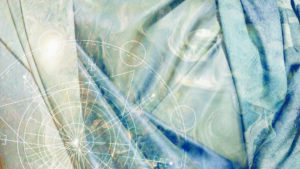 This project initiates new earth-space travel consciousness as a way to prepare ourselves for a future where space travel will be a common thing. 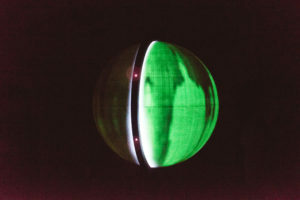 This installation made by Gregor Göttfert & Florian Kofler consists of a sphere circled by optical sensors, scanning and monitoring the environment in real-time like a radar and projecting a transient image of time and space onto the phosphorescent surface of the globe. This ephemeral photography materializes through a ghostly alien-like image our transient state on this planet, leaving us a stranger to ourselves. 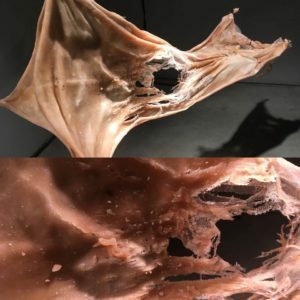 An articulated arm developed by Marco Donnarumma, Neurobiotics Research Lab & Ana Rajcevic invents and effectuates his own « skin cutting » animistic ritual during a whole day period time. Every morning the biomimetic adaptative algorithms get reset in order for the robot to start a fresh and new deep learning session. This performance pattern evolves all-day long by the self teaching action of the robot who mimics the sensorimotor system of mammals. 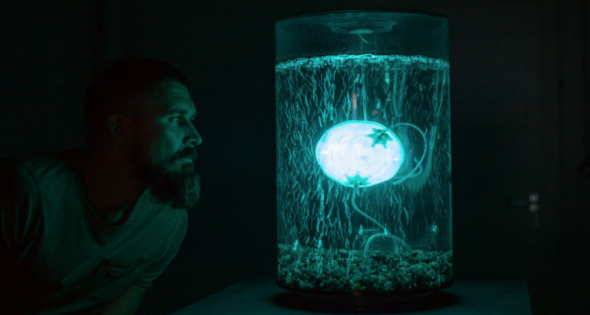 This underwater 3 D printed robotic installation by Anna Dumitriu & Alex May explores what “life” might mean in a post singularity, post climate change future. The project is based on new research about archea called Sulfolobus Scidocaldarius can move around to seek food using tails known as archaella. A film directed by Richard Ramchurn that viewers can control via NeuroSky Mind Wave an EEG headset that uses the brain waves to edit the movie in real-time. This avant-garde tale explores a dark future where brain-computer interfaces are norm. The headset will track your level of attention by measuring your brain waves and readapts the scenario to better stick to your preferences. The Bottled songs of lost children is a series of video letters created by Chloé Galibert-Lainé and Kevin B. Lee that investigates the compulsion of everyday life myth creation on social media. The result is an uncomfortable first-person exploration of the gender dynamics behind ISIS recruitment strategies. 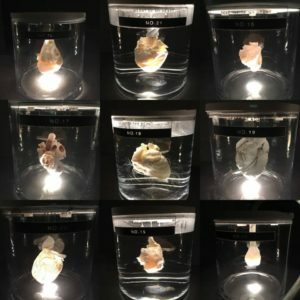 Discarded pig hearts are transformed into esthetically improved hearts for humans by decellularizing them and re-populating them with various techniques…from grotesque to perfect. 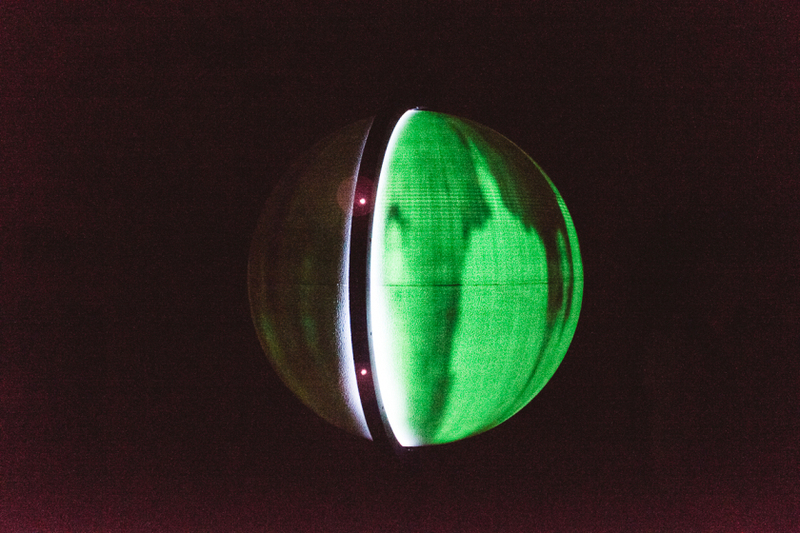 This installation was created by Isaac Monté & Toby Kiers. 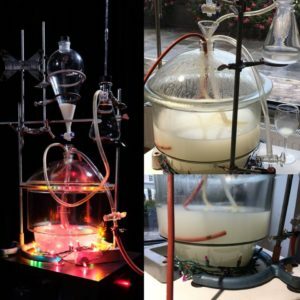 *New era of synthetic biology where organs are stripped of their cellular contents, leaving behind a sterile scaffold that can be repopulated with stem cells. 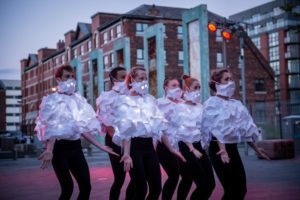 Artistic performance by Marco Donnarumma & Margherita Pevere where the human, the non-human and the machine struggle to access a new form of hybrid identity, in order to reconsider the body and its relationship with new technologies. Trans-disciplinary and post-digital series by Marjan Colletti, Daniela Mitterberger, Tiziano Derme, Georg Crasser that questions the fragility/agility of design, technologie, architecture and environment in the 21s century. Pahoehoe is a fully robotically 3-D printed landscape, a chimera of both man made and natural materials. This project reflects on the troubled, sometimes incompatible relationship between the natural environment and the built environment. 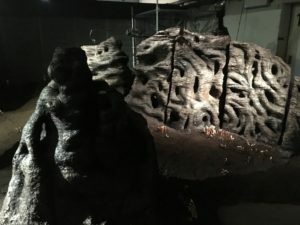 Immersive VR-sculptural installation by Olivia McGilchrist where the artists invites the participants to navigate through an archipelago of possible encounters. In this virtual archipelago the artist unfolds her aesthetical and conceptual world made of filmed performances, writings, photography. We experiment and reflect on issues such as cultural background, métis and hybrid identities, animistic rituals…in a sensible form brought up by the VR installation.